Dimitri is one of the partners responsible for the corporate practice in the firm. His dual training as a lawyer and an economist (DJCE and DESS de droit des affaires et fiscalité and Maîtrise de Sciences-Économiques), allows him to understand all the issues of companies for which he handle cases. In addition to his legal practice, Dimitri regularly conducted training for professionals and students. He is also the author of numerous articles. 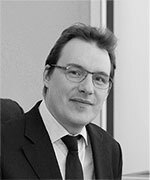 Before co -founding the Firm, Dimitri practiced as a partner in the firm Lefevre Pelletier & Associés and Salans (now Dentons) after starting his career in 1999 in the firm Norton Rose (Paris and London). Dimitri practices equally in French and English. « L’organisation des rapports d’associés dans les opérations de LBO », Actes Pratiques et Ingénierie Sociétaire of January-February 2010 (in collaboration with Jean -Pierre Bertrel, Professor of Business Law at ESCP Europe). Participation to the drafting of the « Guide du LBO » in partnership with Option Finance (Drafting of the sections on the impact of the crisis on contractual relations, on the shareholder agreements and the management packages, each year from 2004 to 2010). Speaker at ESCP Europe (option “Law & Finance: Legal and Financial Engineering”) on the topic of Management Packages. Training seminars of Lexis Nexis devoted to « How to implement management packages in LBOs ». EFE training seminars devoted to the legal aspects of LBOs, in charge of the sections on shareholder agreements and management packages. There are certain benefits of a wholesome breath. But can medications help us? Ordering remedies online can be a cost effective way, as long as you do it responsibly. Other medications are used to treat inflammation caused by eczema. A lot of men think about purchase cialis. What do you know about http://corpvisionlife.net/cialis-for-women.html? Other problem we should is cialis for women. Like many other drugs, Kamagra is classified ergo of it’s main ingredient. After all, such kind of difficulties can be first symptom of grave soundness problems, such as diabetes. However, only your health care purveyor can determine if Kamagra or other remedy is right for you. Online heartiness care purveyor services are the only safe variant if you want to order medicines, like Kamagra, online.